- Community Heated Pool - Pool is heated Thanksgiving week, Christmas week and Mid-March to May. - This property comes with 1 dedicated parking spot in the garage. Additional parking can be found throughout the community. DETAILS: "Mediterranea Penthouse" is a breathtaking, newly remodeled luxury penthouse at Mediterranea of Destin. Boasting an impressive 3,300 square feet indoors and 1,700 square feet of patio space, there is a total of 5,000 square feet of luxurious indoor/outdoor accommodations! Occupying the entire fifth floor of the main building, this incredible penthouse offers unobstructed Gulf views from nearly every room! The open concept Great Room features a wet bar with wine fridge, stand-alone boat bar, multiple seating areas, a 70 inch Smart TV and top-of-the-line entertainment system. An entertainer's delight, the gourmet kitchen is fully stocked and remodeled with high-end appliances. Enjoy dinner at the spacious 10-person dining table with the Gulf as a beautiful backdrop! Make your way to the Gulf-facing balcony for an unheard of 1700 square feet of outdoor entertaining space, running the full length of the condo. Outfitted with dining tables and six chaise lounges, enjoy a meal al fresco or take in one of our famous Gulf coast sunsets! The lovely Master Suite boasts ample space and beautiful natural light with it's double set of floor-to-ceiling sliding glass doors that show off stunning Gulf views and lead to the massive private balcony. Retreat to the master bath for a spa-like oasis with the luxurious jacuzzi tub and walk-in shower. The king guest bedroom offers direct Gulf views, an ensuite bath and private access to the balcony. The bunk room is perfect for kids with it's triple bunk bed (twin top bunk, middle full bunk, bottom twin trundle), TV and ensuite bath. The second private den/media room is an ideal place for a quiet workspace with the desk, or a secondary entertaining spot or great place for extra guests with it's deluxe memory foam queen sleeper sofa. When you're not enjoying this incredible penthouse, take advantage of the community amenities including the massive complex heated pool with Gulf views, tennis court, grilling area, fitness center, private beach access with beach service available, and more! Ideally located, you're just steps from the pool, beach and plenty of local shopping and dining! Book "Mediterranea Penthouse" for your next beach getaway direct with 360 Blue today! We are beyond delighted to hear how much you enjoyed your time at this amazing home for your beach getaway! We appreciate your valuable feedback regarding the mattress and we are happy to say that the homeowner has begun looking into changing that out soon. Also, in regards to linens, all of our homes are apart of the "Clean Linen Project" so we are sorry you dealt with sandy sheets! In the future, please let us know of any situation and we will be happy to address that quickly. As for the dryer, thanks to your review, we have since corrected that and everything is working perfectly. Thank you again for your feedback and for the wonderful photo you attached! It really shows the beautiful view in store for our guests! Thank you for staying with 360 Blue, we hope to see you again soon! Exceeded expectations with just the view. Icing on the cake was how intentional the owners were with every touch. So very comfortable and extremely well stocked! We’ll be back! We could not agree more! This condo is a wonderful option for a fun beach getaway and the view from this condo is second to none! We adore the photo you shared with us, it really shows how much fun you all had! We are looking forward to seeing you all again soon! What a beautiful and relaxing spot on the gulf coast, thank you to the owner for sharing such a wonderful place. Destin is our second home and we make this trip yearly, so glad we found this place and also thanks to a great rental company, 360 Blue is the best! What a fun photo! We are thrilled that you had such a wonderful vacation in Miramar Beach! Thank you so much for staying with 360 Blue and we can't wait to have you back at the beach again soon! We had the best New Year’s Trip at this place. It is so big, open and spacious with beautiful furnishings and a breathtaking view. Very comfortable beds and the kitchen was well stocked for cooking for a group. The rooms are all good sized. We enjoyed the hot tub, the weather was too cold for the pool, but we did walk down to the beach which is directly across the street. The sunsets were gorgeous. The only drawback was that we had to check out! We’re looking forward to staying again in summer. It sounds like everyone had a truly amazing time ringing in the new year! We are thrilled that you enjoyed your time in this beautiful home and we look forward to having you back soon! Loved it! Spent a girls trip in June at this amazing property. I had never been to the panhandle of Florida before and absolutely fell in love with this penthouse and the character and the weather of Miramar Beach. The location was perfect with just the right amount of activities and quiet. We took long walks on the private beach, went boogie boarding, biking, followed by a dip in the pool and hot tub. Took painting lessons and enjoyed daily evening live music right on the beach across the street plus found great shopping and dining all within walking distance. Spent quiet evenings on the balcony sharing a glass of wine and conversation in the well equipped kitchen while cooking dinner, and the bedrooms so comfortable with views of the ocean in each of the master bedrooms. Everything was clean and new, with internet and cable and beautifully decorated. It is definitely a must stay property, i can\'t wait to go back and share it with my family. We are beyond thrilled that you had such a wonderful stay in this beautiful home for your first trip to the emerald coast. Thank you for choosing 360 Blue. We hope to see you back for many more trips to the panhandle! Absolutely 5-Star experience all around. We’ve stayed at this property close to 10 times now, but there is truly nothing like the Penthouse. It’s incredibly well appointed and fully stocked in the kitchen, and was spotless when we arrived. We can’t wait to come back! What a great photo! You really captured the beautiful pool area of this property! We are pleased to hear you enjoyed your stay with us so thoroughly! Thank you so much for choosing 360 Blue for your beach vacation. Be sure to come back and visit us again soon! Beautiful home, so comfortable and our family loved the pool and quick access to the private beach. 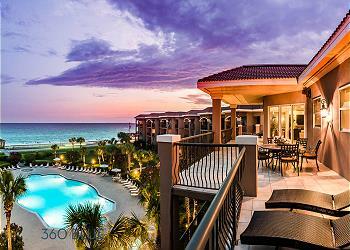 Great location near the best restaurants and can't wait to stay again on our next trip to Miramar beach. What a great group photo! We are delighted to hear you enjoyed your stay and the home so much! It really is in the perfect location for the private beach! Thank you so much for choosing 360 Blue, and taking a moment to share your experience with us. We hope to see you all back again soon! We had a wonderful time. The penthouse was just beautiful and spacious for a family of 10. The location was perfect, so many activities and restaurants within walking distance. The balcony was incredible! Our family really enjoyed all the space for meals, watching all the beach activities and sunsets. We rented it again in September and can\'t wait to bring our grandkids . I know they will love it as much as we did! We are so thrilled that you loved this beautiful home as much as we do. It is the perfect place for a family beach getaway! We are looking forward to having you and the grandkids back in the fall!